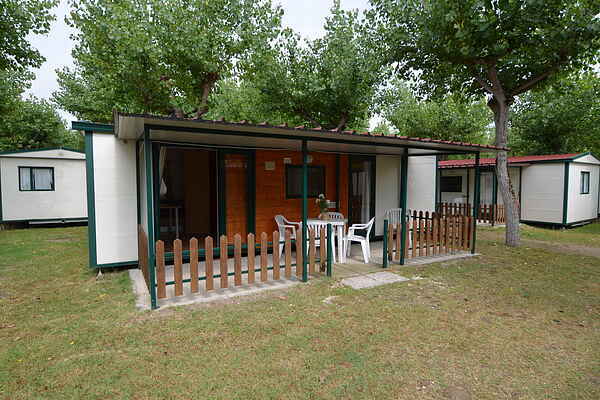 The mobile home is located in Lido di Dante, a seaside resort of the Adriatic coast about 6 Km from the city of Ravenna and 8 km from the amusement park of Mirabilandia. The mobile home is surrounded by nature and nestled into the Foce del Bevano natural park, an oasis with 3 km of uncontaminated beach where local vegetation and wildlife are protected. In 2003 Legambiente, the most widespread environmental NGO in Italy, elected the beach of Lido di Dante (and the portion of Classe pinewood surrounding it) as one of the 10 most beautiful and uncontaminated in Italy. The area consists in 100.000 square meters of peaceful and shady land almost untouched by human presence, ideal for those who desire to spend a relaxing holiday in full contact with nature. The beach can be reached from the camping with a 200-meter walk through the pinewood. With tennis, volleyball, ping ping, football, petanque and swimming pool. In the bedroom with three beds the third bed is only suitable for children under 12 years.